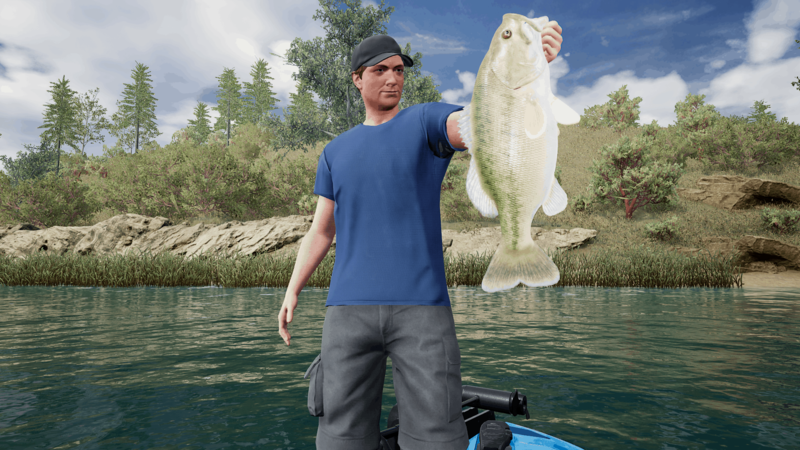 Use your sonar or watch the water - When you are driving along the lake in your boat, you’re sonar is giving you information on the current depth of the water and it is showing fish icons when you pass over any. The sonar is located under the middle of your boat so if you pass over fish, turn round and go back to the spot that you located them. If you are fishing from the shoreline, look for splashes and ripples in the water. Consider the weather - The weather conditions and light levels are going to play a huge part in what lures will be most effective. Clear skies will favour the shiny or metallic coloured lures such as the Rat L Trap Chrome Blue Black. Cloudy conditions favour brighter colours such as the Rat L Trap Red Crawfish. Fish the right depth - The lures in the game operate at different depths of the water and you need to choose the correct lure based on what depth you have seen the fish showing at on your radar. There is no point fishing for them near the surface if the radar showed they were at the bottom of 30ft of water. Use the correct retrieval - The lures have different retrieval methods associated to them based which can be seen in their explanation when you select them. Ensure you use one of the appropriate retrieval methods to ensure they lure is attractive as possible to the fish. Work your swim - The final tip – work the area of water that your boat covers. You’ve seen the fish on your radar but they may have moved off slightly. Start off by casting to the left of your boat and then keep recasting, slowly moving more and more right across the water until you find where they are.